When a lot of people think about going to Mexico, they think of an all-inclusive vacation in Cancún or Cabo San Lucas. AKA Americanized tourist meccas geared to give you just enough sandy beaches and cheap booze to make you feel like you’re in a tropical place, while still feeling comfortable enough to not have to understand a lick of Spanish. To that point, we’re fed by the media to be afraid of this beautiful country and “never leave the resort” – it’s definitely not as popular an opinion in Canada as it is in The United States, but a familiar warning nonetheless. 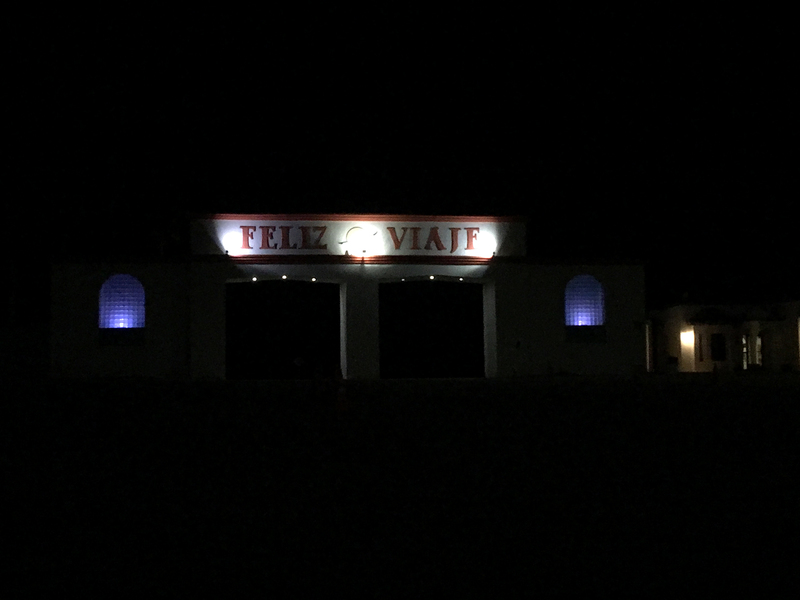 With our travel advisory apprehensions in check, we made our way out of Yuma to the border in San Luis Río Colorado. As two young people in a Scooby Doo van, we got searched entering Mexico. I must say, the guards were so polite and friendly and oddly unintimidating despite their fellow officers with machine guns on either side of them. 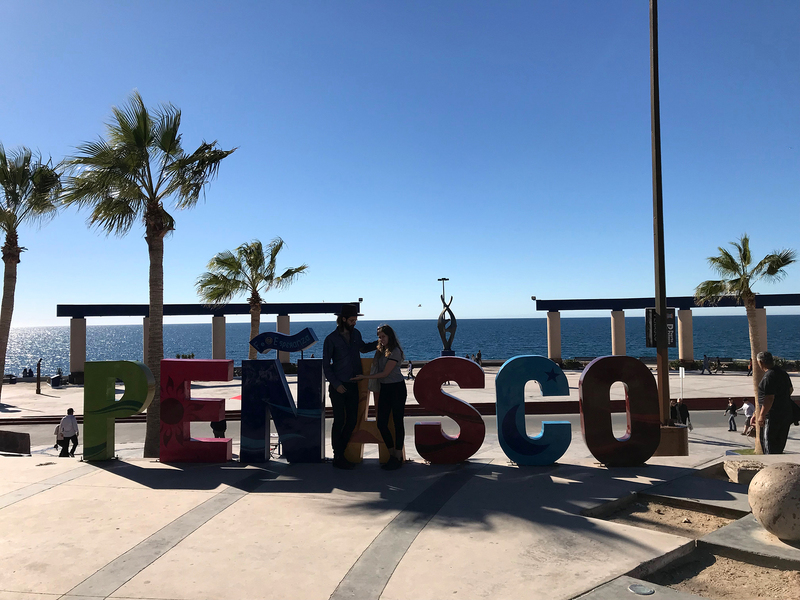 We carried on without trouble and made our way toward Puerto Peñasco, or Rocky Point in English, a total gringo vacation town where prices are even presented in USD. Don’t get me wrong, the town and the view of the Sea of Cortez is lovely, but it definitely fits in the margins of the category I made fun of earlier. People trying to sell you mass-produced “authentic” goods and discount pharmaceuticals (they seemed to have more Viagra than a Pfizer factory) made walking down the street a game of Frogger. Our ultimate destination was Teacapán, Sinaloa – a small fishing village about 2 hours south of Mazatlán where Justin’s aunt has a house. From the border, it was to be about a 3 day trek down. After lunch at a waterfront restaurant in Puerto Peñasco, we started making our way toward Puerto Libertad, where we had planned to stay for the night. Upon arriving to the tiny beach town, we realized that there definitely was no RV Park to be found and that a misunderstanding on a website had led us astray. We rolled up to the Pemex and asked if it was safe to stay the night there. The immediate “no” that came out of the attendant’s mouth made it quite clear that we were to hop back on the highway and keep driving. To be fair, I don’t think that this town was necessarily dangerous, it just wasn’t the Flying J that semis and other travellers would pull into and park for the night. We were a van and a C Class motorhome that didn’t really scream “locals”. So what now? The nearest RV Park was over 2 hours away and sunset wasn’t far off. We didn’t feel like we had much of a choice so we got back on the road. I want to make it clear that despite our critical view on fearing Mexico, driving at night was something we wanted to avoid. And go figure, on our first night, we found ourselves cruising through the dark (it was only early in the evening so not totally disturbing, but still really, really dark). Nighttime driving aside, the biggest mistake we made was taking the state highway instead of the federal highway. We can’t blame our past selves because we didn’t know the road would be that bad but yikes, we’ve never experienced deeper car-swallowing potholes in our lives. At first it was like a video game, swerving to avoid the odd crater and then it just became downright scary. We had to slow down to a MAXIMUM of 40 km/h (25 mph) in order to not pop a tire or completely wreck the undercarriage of the van. I say completely wreck because it definitely took a beating, even when we were trying our damnedest to be cautious. Luckily traffic was very light (wonder why…) because moving into the oncoming traffic lane was as inevitable as the potholes. Suddenly the 2.5 hour drive started to feel like it was going to be a lot longer. We did pass a number of state and federal police checks that all seemed friendly enough to just make fun of our poor Spanish before waving us along. One shady occurrence was a group of 5-6 cars (some with California plates, others with Sonora plates and the rest with none) that travelled in a close group that would pull over then speed up periodically. Normally this would probably mean bad news but fortunately, they didn’t bother us. 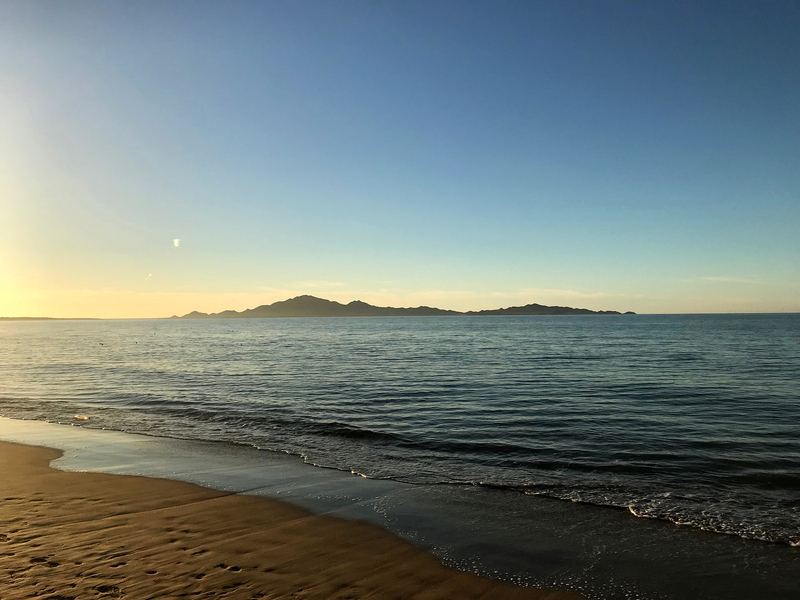 Peeling our clammy hands and white knuckles off the wheel, we arrived in Bahía Kino and set up at Islandia RV Park and Marina. The owner was lovely and it was such a relief to have a safe spot to sleep for the night in such a beautiful location. Sunrise gave us our first real opportunity to admire the beachfront and chat with other travellers passing through. 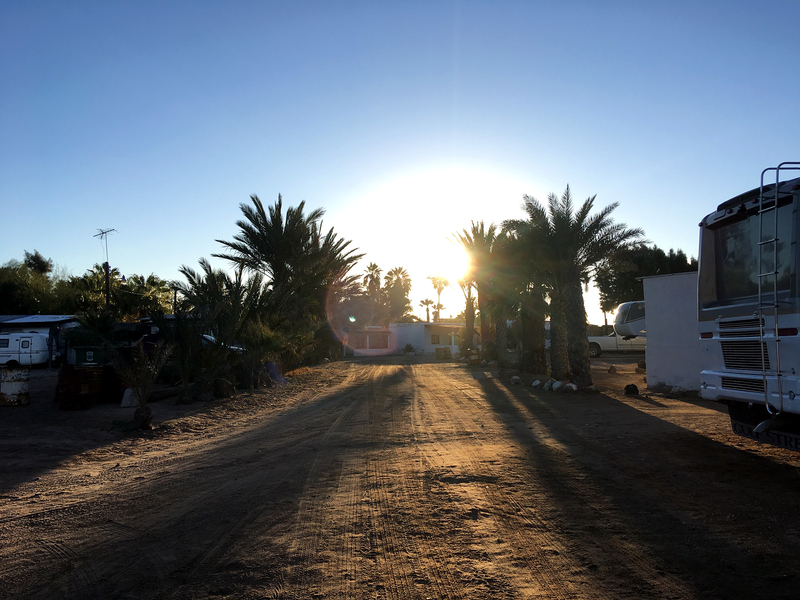 Our next order of business was getting our temporary vehicle permits necessary to exit the “hassle-free zone” that is the Baja Peninsula and the western side of Sonora. In the simplest terms, you need a permit to operate a foreign vehicle in the rest of Mexico. We already had Mexican auto insurance so you pay a fee, get a sticker and get your money back upon leaving the country. Easy enough so before heading to Guaymas to get it, I decided to give the office a call to see what documents we needed to get the permit. That’s when we realized we did not get our tourist cards (FMMs). Oops! This was quite a silly oversight on our parts as we were supposed to get it in San Luis right after entering. We can blame the border guards all we want for not directing us there (they were apparently supposed to) but at the end of the day, we should have prepared better and sought it out immediately. We were told that even though we had auto insurance, they wouldn’t honour it without a tourist card. This mistake meant driving back to the nearest border, Nogales. If you’re familiar with Mexican geography then you know that that’s a 5 hour haul from where we were, essentially erasing all the ground we covered the previous day. 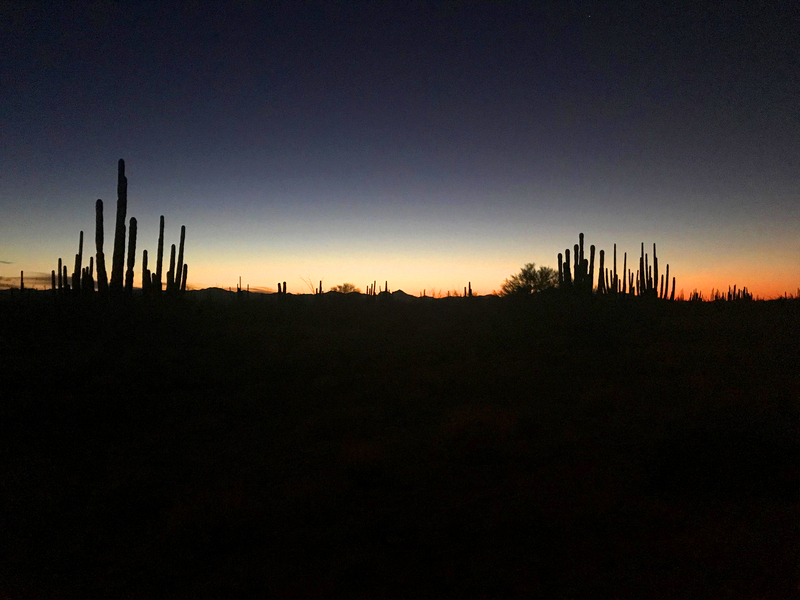 Justin and I decided that it just wasn’t worth the hours and wear and tear on our vehicle to make the rest of the drive down after having to start over, so we parted ways with our convoy crew after successfully getting our tourist cards in Nogales. 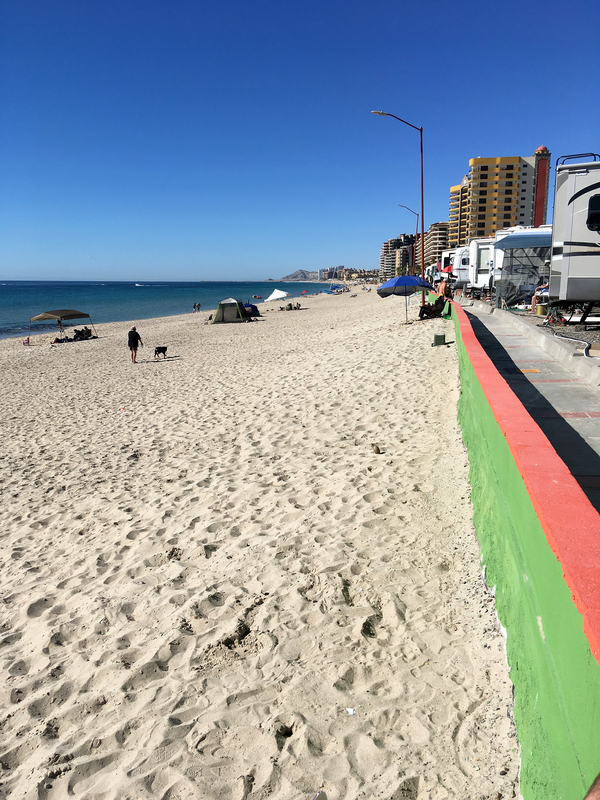 It was Friday by this point and New Year’s weekend so we figured we’d stay the weekend in Puerto Peñasco and cross back into the States in time for the work week. No doubt it was a bit of a drag but we just couldn’t justify spending 8 full days of our allotted two weeks driving. Anyway, we made a stop that evening in Santa Ana to spare us from another nighttime drive after an already stressful day. I couldn’t write this blog post without mentioning our dear friend, Edgar Osuna. Originally planning to camp out at a gas station for the night, we zoomed past a homemade sign that said “RV PARK OPEN” right off the 15. We turned around and checked it out and were very glad we did. The RV Park itself was nothing to write home about, with electrical and limited water hookups but no bathrooms or showers. All that mattered to us was that it was a safe place to rest our heads and it was only 200 pesos, after all (about $13 CAD or $10 USD). We got to talking with the owner, Edgar, and discovered that he loved Canadians and his late wife was actually American. At 74 years old, Edgar is paralyzed on his left side but still full of life. He greeted us the next morning and told us stories of how he toured in a band called The Thunderbirds (the Mexican version, he added) in the 60s and used to love driving through Mexico and America. He was the sweetest man to talk to and a local celebrity in the town. I highly encourage anyone to visit him at Punta Vista RV Park if you’re ever passing through Santa Ana. ♥ Edgar ♥ The sweetest Mexican rockstar you’ll ever meet! 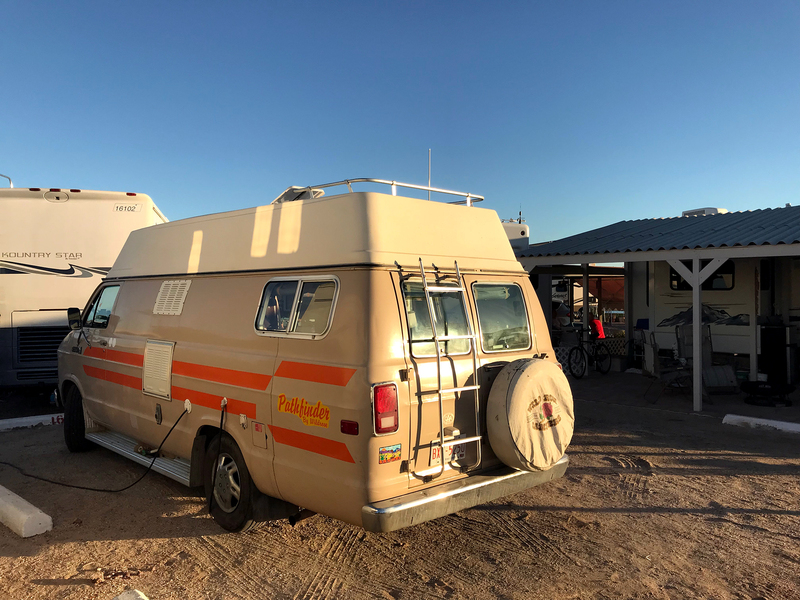 The RV Park we scouted out to stay for the weekend was on the west side of Puerto Peñasco, where all of the hotels and resorts are – about a 10 min drive away from the town. Despite not being in a “beachfront” spot, we were just a stone’s throw away from the sandy shores of the Gulf of California. As Justin says, this place was like Arizona Lite. There were many seasonal spots with permanent decks and patios where Arizonans came down for 6-7 months of the year to escape winter (wait, Arizona’s not cold?! It is the sunshine destination for tons of Albertan snowbirds). Essentially, everyone was a sunbaked gringo on vacation. Fine by us, as we were the same – just pale. We enjoyed some beers on the beach and spent the evening on our neighbours’ patio drinking tequila and Tecates. They were indeed Arizonans but were originally from Alaska and New York; they’ve done their fair share of cold winters so I completely understand why retiring in Mexico would be a dream come true. As fate would have it, our neighbours on the other side were travellers from Kelowna, BC! We celebrated in true Canadian fashion by being civilized, polite and friendly, ha. Unfortunately, when New Year’s Eve rolled around, Justin was dead sick. While he rested in the van, I went to a bonfire party with our newly acquainted Arizonan friends and watched some fireworks over the beach. 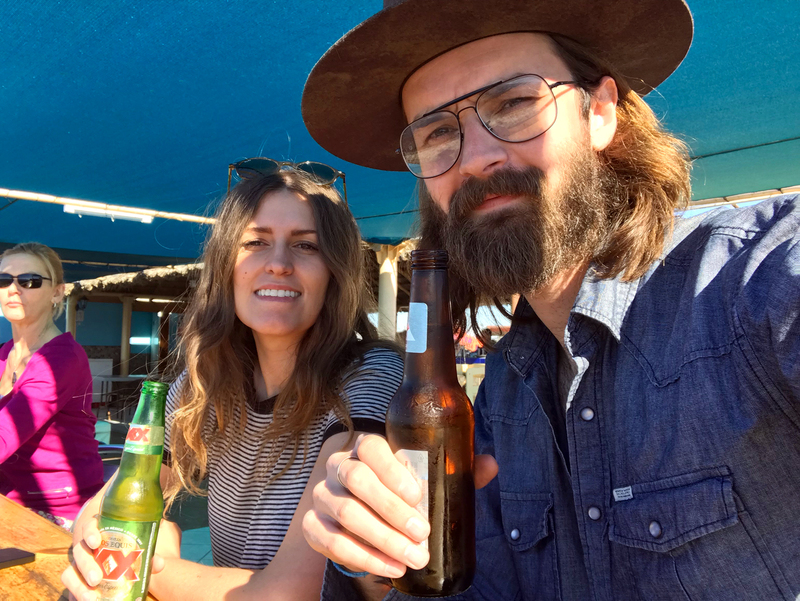 It was a rough beginning to the year with Justin’s flu and my hangover but we couldn’t overlook how awesome it was that we were starting it off in Mexico, in our van, doing exactly what we want to do. Not gonna turn this into some sappy reflection post but we definitely feel super happy to be doing what we’re doing and are so stoked about all the amazing people we’ve met along the way and all the ones we’re yet to meet in interesting places in the near future. We decided that we’d stay the work week instead of leaving after the weekend because…why not? There was passable wifi, it was cheaper than most American parks, our tourist cards were good for 7 days, oh and being by the beach didn’t hurt. Go figure it was one of the busiest work weeks (we even had to pass up going to tequila shot bingo, sigh) but we certainly couldn’t complain about sitting on a beach after clocking out. We had an awesome time and made lots of new friends but were ready to go back to the US for cheap gas and nicely paved roads. 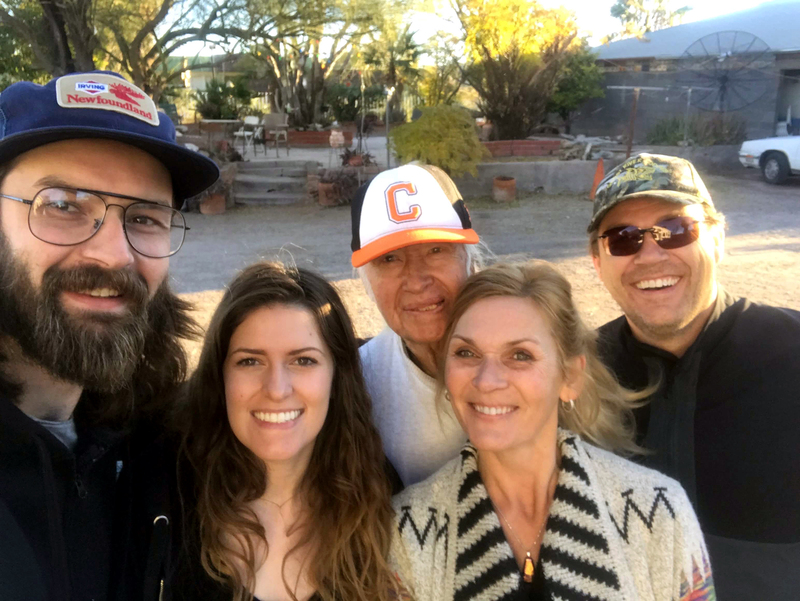 We said our goodbyes and made the short drive to the border crossing into Lukeville, AZ and geared up for an intense search. We’d also been warned that there were often cops camped out in a couple of the small towns you drive through, waiting to give you a “speeding ticket” (get their palms greased) but we were lucky enough not to run into any trouble. The border crossing was a breeze – it was actually easier for us to get into the States from Mexico than it was from Canada. Seems odd but we had nothing on us anyhow. All in all, we loved Mexico but will definitely prepare better next time we go. A word to the wise: gas is expensive (about on par with Canadian prices but significantly more expensive than American) and RV Parks aren’t too common so plan accordingly because it’s not worth taking the same risks you might be comfortable with in America by parking on a deserted beach or in the desert. 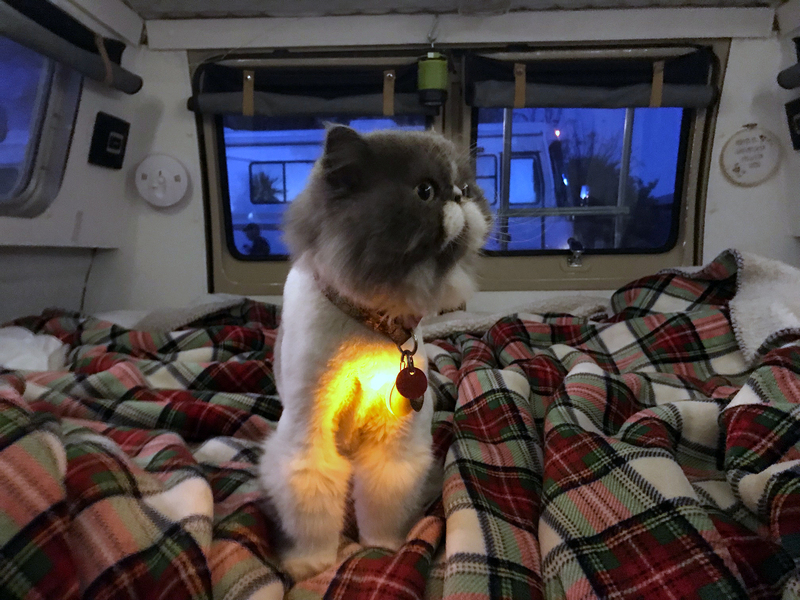 This website as a whole is pretty handy and constantly referenced by travelling Americans, but on this page you can see all the RV Parks on the northern west coast – you’ll see what I mean about them being few and far between. All about tourist cards (FMM) here. All about vehicle permits here. You can even do this in advance here and pick it up upon arriving in Mexico. That woulda been smart to do, huh! This Mexico Mike dude does a good job summin’ it all up. He also was the only avenue we found to find info on the vehicle registration centre in Empalme (just south of Guaymas). Vanned your way through Mexico? Tell us about it! We’d love to share stories.